IDW Sets Up Down Under! San Diego, CA (June 10, 2014) – Over two weekends this June, IDW CEO & Publisher Ted Adams and Chief Creative Officer/Editor-in-Chief Chris Ryall will be on hand at the Supanova Pop Culture Expo in Sydney and Perth, Australia, giving international fans an inside look at the workings and future of IDW Publishing! Together, they’ll be hosting panels, signing books, and celebrating IDW’s 15th Anniversary with fans from across the globe. From June 13-15, Adams and Ryall can be found at the Sydney Showground, when Supanova kicks off in the metropolitan hub. At the IDW booth, you can stock up on IDW books as well as pick up an exclusive Supanova convention cover to Mars Attacks: First Born #2, written by Ryall and illustrated by Sam Kieth. The exclusive image adorning the cover is the first-ever “photo-selfie” with Adams and Ryall. This unique convention exclusive is limited to 250 copies for each of the Supanova conventions they will be attending this summer. Also signing at the IDW booth will be artist/designer Ashley Wood, who will be showcasing an exclusive action figure through his 3A Toys line, as well as an array of his many IDW art books and comics, such as Zombies vs Robots, co-created with Ryall. TMNT cover/trading-card artist, Jon Sommariva, will also be signing and sketching at the IDW booth during the conventions. IDW will be conducting Cover Talent Search sessions and General Portfolio Reviews at both shows. In Sydney, cover artists can bring their portfolios by the booth on Friday, from 15:00 – 16:00, and 14:30 – 15:30 on Saturday and Sunday. General portfolio reviews will be conducted from 16:30 – 17:30 on Friday, and 16:00 – 17:00 on Saturday and Sunday. 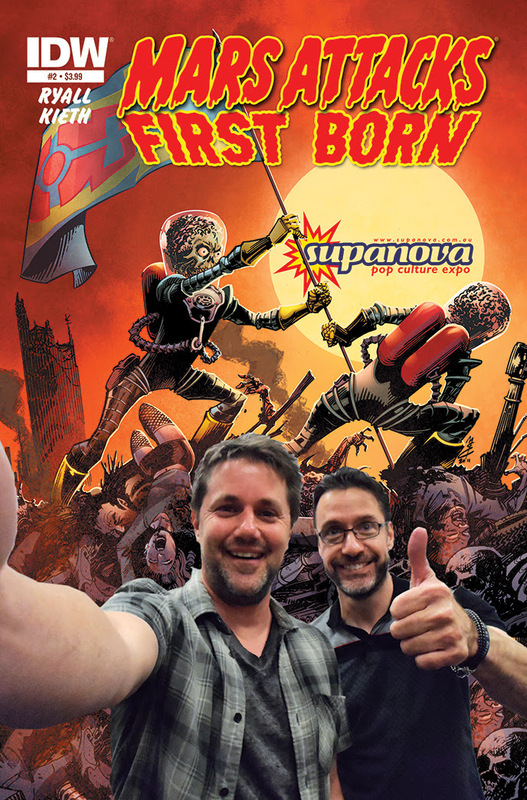 The following weekend, June 20th – 22nd Supanova and IDW head to the Perth Convention & Exhibition Centre, where panels, portfolio reviews, and access to the exclusive Mars Attacks cover will again be taking place throughout the weekend. Aspiring artists in Perth can bring their cover work for review from 14:30 – 15:30 on Saturday and Sunday, and general portfolios by between16:00 – 17:00. Follow IDW on Facebook at facebook.com/idwpublishing and on Twitter @IDWPublishing for updates during the show, and to find out where we’ll be next! IDW is an award-winning publisher of comic books, graphic novels and trade paperbacks, based in San Diego, California. Renowned for its diverse catalog of licensed and independent titles, IDW publishes some of the most successful and popular titles in the industry, including: Hasbro’s The TRANSFORMERS, G.I. JOE and MY LITTLE PONY; Paramount’s Star Trek; Nickelodeon’s Teenage Mutant Ninja Turtles; 2000AD’s Judge Dredd; The Rocketeer; Toho’s Godzilla; Wizards of the Coast’s Magic: The Gathering and Dungeons & Dragons; V-Wars from New York Times best-selling author Jonathan Maberry; Ragnarök from Eisner Award-winner Walter Simonson; Winterworld, created by Chuck Dixon and Jorge Zaffino; and Little Nemo from the award-winning duo of Eric Shanower and Gabriel Rodriguez. IDW is also home to the Library of American Comics imprint, which publishes classic comic reprints, Yoe! Books, a partnership with Yoe! Studio, and the multiple award-winning Artist’s Edition imprint.